Penny Arcade Expo 2008 banner ad perpetuates stereotype? I am a fan of Penny Arcade, but do you think this ad for Penny Arcade Expo 2008 perpetuates the Asian chick / Caucasian dude stereotype? I was going to say Caucasian dork, but the Asian girl is actually the one holding the DS. Organized jointly by the Chinese Family Service of Greater Montreal and the New Voices Project (Montreal), Interracial relationships and Shortcomings is an open discussion stemming from a reading of Japanese-American Adrian Tomine's graphic novel Shortcomings. 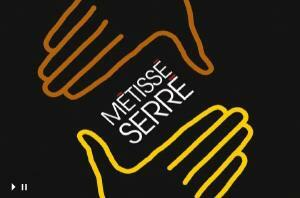 This will be held on this coming Sunday, 4PM, at the CFSGM (987, Rue Côté) and is open to everyone. You don't even need to have read the book to be able to fully participate in the discussion! English and French, and special refreshments will be served. Organisé conjointement par le Service à la Famille Chinoise du Grand Montréal et le Projet Nouvelles Voix, Relations interraciales et Shortcomings est une discussion ouverte découlant de la lecture de la bande dessinée Shortcomings de l'Américain d'origine japonaise, Adrian Tomine. Ça aura lieu ce dimanche, 16 h, au SFCGM (987, Rue Côté) et c'est ouvert à tous ! 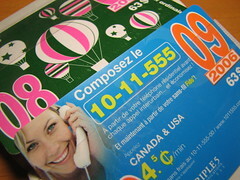 En français et en anglais, et on servira une collation spéciale. Last few hours of 2007, and I am launching "Comme les Chinois", a blog on Chinese-Canadianess/Quebecness in this country's both official languages. La Bouchard-Taylor était à Montréal cette semaine. Ils étaient arrivés la semaine d'avant, de passage dans le quartier Côte-des-Neiges, dans la seule ville vraiment multiculturelle du Québec. Je ne sais pas vraiment ce qui m'a pris de me présenter au Palais des Congrès ce mardi et jeudi soirs, sans m'être inscrit d'avance, mais ayant tout de même suivi de plus ou moins près (plus que mes pairs, en tout cas) le débat généré par les accommodements raisonnables ici. Continue reading La commission des raisonnables. If you check out the replays of tonight's edition of La Zone, you will notice that they're spending half the show arguing about the Canadiens' captain (a Finn) not being able to speak French! Omg, the reasonable accommodation debate boils over in the entire society. Radio-Canada regularly organizes "Midi de la Maison", special events on lunchtime for employees. Today's, as I brought along the lunch that my roommate made -a clam salsa with Chinese sausages, over rice-, was appropriately the showing of movies from the Métissé serré contest on Radio-Canada International (the English service has something called Digital Diversity), which is a competition of shorts filmed from the audience, on immigration, racism, multiculturalism, some funny, some a little more serious. The submission of material is complete, but the voting is just starting (a Flash page with all competing videos). « Accommodements Raisonnables et Communauté Chinoise » aura lieu le dimanche 16 septembre 2007 et débutera à 14h00 (lieu à déterminer d'ici vendredi). "Reasonable Accommodations and the Chinese Community" will take place on Sunday, September 16th, 2007 at 2PM in Chinatown (venue to be announced by Friday). 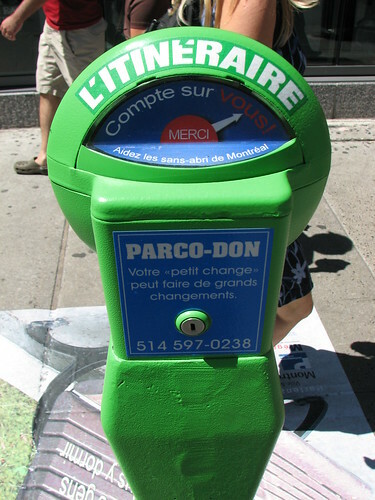 We saw these all over downtown, in particular close to today's Montreal business centre of Avenue McGill College and Rue Ste-Catherine, sponsored by L'Itinéraire, a community group that sells a magazine of the same name (often containing pieces by and on known personalities) through homeless people, as an alternative to beggary. The co-presidents had a very moderate, if not appeasing, point of view during this morning's press briefing (In French), in my opinion, and is worth listening if you are interested in this universal problem with a specific manifestation here in Quebec, a French-speaking islet in a English-speaking sea that is Canada (and the US). This topic touches me particularly, even if I don't necessarily need to face its consequences directly on a daily basis, because I am French/English bilingual (with a preference for French), and originate from the Chinese community. Continue reading Accommodements raisonnables (the website) and the Chinese community. 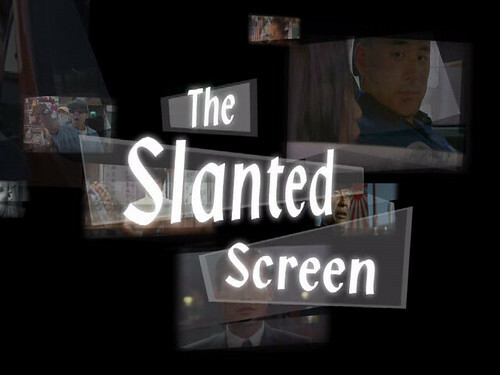 The Slanted Screen is a documentary film by Jeff Adachi. A screening of The Slanted Screen will be presented on Friday July 27th at 7PM, at the Chinese Family Service of Greater Montreal. The movie lasts for 60 minutes, and a short discussion will follow. 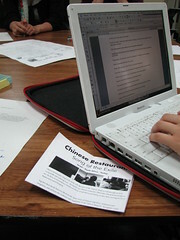 It is a follow-up to the General Tao, Kung Fu, Ching Chong round table on Chinese identity and multiculturalism in Canada held in early June 2007, and screening of Chinese Restaurants during the same month. Facebook event for this activity. Continue reading The Slanted Screen. The first Karen is Karen Tam. I just finished speed-reading through the book to her 2004 exhibit at the M-A-I called Gold Mountain Restaurant Montagne d'Or, which I picked up at the Grande Bibliothèque (late by two days now, and back by the end of today) six weeks ago, as I was doing some background research for the round table. It took me a while to realize what it was about, because I was originally looking for a documentary film, not an art exhibit that is a critique of orientalism through the recreation of a Chinese restaurant with a number of interesting modifications, justaposition of objects not usually found in the real world. The installation was of great interest for me, especially after the experience of Chinese Restaurants, even if in fact, what I had in mind entering the Bibliothèque was (vaguely) the work by a second Karen, Karen Cho. That was a movie called In the Shadow of Gold Mountain, a documentary, also made in 2004, telling the story of survivors of the exclusion act era. The Chinese Family Service showed her movie at some point during the past year, but I wasn't following the e-mail lists carefully, and missed it. However, I clearly remember this Karen speaking at the public hearings in Montreal for the then-upcoming formal apology by the Canadian govt, emotionally describing the hardships of Canadian Chinese of this era, including that of her own family. But then, I have no idea why "Gold Mountain Restaurant" was not totally unfamiliar. To make matters even more confusing, both are Montrealers by birth, graduated from Concordia (albeit in different concentrations, of course). So, Gold Mountain Restaurant: an art installation by Karen Tam, and In the Shadow of Gold Mountain, a documentary film by Karen Cho. Got it. This week on The Link we're taking a look at how different generations of the same cultural community can sometimes be opposed to one another. Some of the first immigrants to arrive in Canada were the Chinese, and since then, the Chinese community has grown into one of the biggest in Canada. But saying "Chinese community" is a bit of a misnomer, since there are many different ways of being Chinese-Canadian, it's actually a very multicultural community. And not everyone is necessarily comfortable with one another. For more on this, we're joined by Bethany Or. Continue reading Inter-cultural clash: Chinese communities. We finally had the round table. It was a very positive experience, I think, and will hopefully spark some interest for more. The topic is simply too expansive and universal to cover in a single session. From a personal standpoint, I guess that I know better what to expect. So, does the Chinese Canadian community in Montreal need a voice? I know from seeing today's attendance of twenty-ish people that there are people in this city interested enough to spend their Sunday afternoon with strangers to talk about stereotypes, their experience growing up here. We are by no means a monolithic group of people, and share a vast range of opinions about the place of Chinese people in Canada. Next activity: Cheuk Kwan's Chinese Restaurants (English w/ French subs), on Friday June 15th, 6:30PM, at the CFSGM. Previous press coverage include this interview where I attempt to speak about complicated matters in my unrecoverably broken Chinese. Future press coverage include a part in a report by Bethany Or of RCI, to be aired this coming Tuesday. Continue reading The kung fu fighter eats General Tao chicken. The discussion is going to be held this Sunday June 3rd, 2007 at 2PM in Chinatown (4th floor). Here is the official press release, bilingual (French and English). Open to the public. The round table is aimed towards ordinary Canadian Chinese who may be apolitical or apathetic. We want to bring together people with simple questions which may confront them on a daily basis such as “Why am I being asked 'Where I am from? '”, despite being born here, or having a family which may have been established in this land for many decades, or even centuries. The round table on Chinese identity in a multicultural Canada will be held on June 3rd at 2PM at the Main Hall of the Chinese Family Service (987 Rue Côté in Chinatown) and is bilingual, English and French. RSVP on Facebook or Google Groups. As for the show, catch it on 207 on Bell ExpressVu this week on Tuesday at 1PM, Wednesday at 9:30AM, Thursday at 4PM and Saturday at 9AM (phew, no more prime time). Original time that the show is shown is Mondays at 10PM. "General Tao, Kung Fu, Ching-chong: Chinese identity in multicultural Canada" is the official title of the round table. I've been co-organizing it with a couple of other volunteers at the Chinese Family Service (their server is currently kaputt, alas) for at least the past two weeks. The original idea came from speaking intensely and passionately with the volunteers' coordinator about ideas what it meant to be Chinese and what it meant in the Canadian context. It is the least that I can do, I think, to try and reproduce those private talks that I often have with friends about the meaning of being a CBC (Canadian Born Chinese), FOB (Fresh Off the Boat) and other categorizations of people of Chinese descent in Canada, or abroad from their "original" country. Perhaps the summarization of the most controversial point is: are Asians (in particular, the Chinese, as we are particularly, while not exclusively, interested in this discussion) considered perpetual immigrants, and/or is it a good/bad thing, and is it something that is desired? I can tell that within the organizing group, we had originally planned an hour meeting last Friday, which ended up being three hours long (and four and a half hours for those who went dinner afterwards). The answer is not easy, and multidimensional. On Sunday, we went to see Cheuk Kwan's Chinese Restaurants, a movie that talks about the Chinese diaspora through the eyes of restaurant owners around the world, from places as exotic as Norway or Brazil. I mean, I think that this movie (or series of) is a fun way to give people some perspective about all the diasporas of this world. I'm not sure when, but we will be showing sections of the movie in the next month or so (perhaps even at the round table, if time allows). I saw a set of episodes last year too, and I love it when my posts rank high on Google. 987, Rue Côté, 4th Floor (basically the main hall of the Chinese Family Service). Well, that's about it. There was the interesting bit that I got an interview on cultural television (aka CH-M), on Hu ZhiMin's show "Sino-Montréal". It was just a pure Cedric moment for eight minutes... It highlighted how pathetic my Cantonese indeed is (at least I think that my French and English are both close to flawless), the contradiction of being neither Chinese or Canadian or Québécois (but all three at once). It was hopefully not live, and would be aired in two weeks from now, at various times of the week. Part of my evening was spent at the Chinese Family Service of Greater Montreal (shown in collab with the Sierra Club), watching a short documentary following the lives of fishermen in small-town Taiwan called “Fisherman's Life", （河口人）. It was not even in Mandarin/Guoyu, but in Taiwanese dialect, and the subtitles were in Chinese. It was nonetheless easy and straightforward to understand: the adoption of modernity in an indirect way forces the reluctant ones out. One could argue that you could indeed not give a damn about globalization et al., and just uproot entire communities and impose them an urban lifestyle, and make their family plantations into corporation-owned ones, or their fishing activities into vast pisciculture operations. But of course, the idea is that freedom of choice remains the foremost value in these societies, and that if they want to live in small villages, they can, and should be able to do so. I‘m probably a little desensitized. In our society, the only couple of things worth something is a vote, and the power of money, or that which you have of choosing to support the causes of those you deem worthy of. The film's director (I think?) has a blog. Even if yours truly couldn't understand most of what was said or written during the movie, it remains very beautiful visually, and eye-opening, giving one a new perspective of Taiwan. There's the issue of "accomodement raisonnable" or "reasonable arrangement" raging over here in Quebec, punctuated with surveys of inflammatory properties, and just yesterday, small-town Quebec adding their voices to the debate. I still think that talking about it is a good thing, rather than bottling up, and then exploding with all the damage that compressed rage and misunderstanding may cause. The small town of Herouxville near Trois-Rivieres published a document for immigrants that state a few too obvious rules such as "stoning of women is forbidden in Herouxville", and sent it to politicians at the provincial and federal level. I don't know if it's a publicity stunt, or whether the people realized what they said. It seems to me that it is motivated by ignorance, putting all immigrants of certain origins in the same basket, or that it is shock method employed by marginalized people (rural Quebecers) to provoke a harder, more clear-cut stance on societal norms than "accommodements raisonnables". In other news, Fiona in Changchun was published in the China Daily this weekend! It was random chance if I picked up a copy of Giant Robot, *the* Asian-American pop culture magazine, which I previously thought was a webzine (another case of not paying attention enough). After work, which consisted in a surprise assignment to faraway Lasalle (an hour of bus, metro to go, and another hour back, and plenty of time to nap in the midst of it), I went back all the way downtown to kill some time. Went in the Chapters, and on my way from seeing whether the newest Economist was on stand already (because I'm curious to know whether the Holidays issue will be in my mailbox before Christmas), I caught a glimpse of "Giant Robot" over at the "specialty" magazine stand, which also consists of feminist pamphlets, magazines on tatoos, and all sorts of activist papers. So, after less than ten seconds of reflexion, I snatched a copy of it, and quickly went to the cash to pay. While skimming through the pages in the metro, I found out that there was an interview on The Pancakes! Pleasant surprise, it was, as I've been listening to a lot of her music in the past few days, as I moved from sweet Chinese pop to sweet Chinese indie pop (I lack in the latter, or even the former, so it's all relatively speaking). The music is always relatively joyful, with lyrics that are otherwise tragic personal human feelings. I tend to adhere a lot more to this vision of life, where anything tragic isn't actually tragic, than that of putting your hard-hat on, and steel-capped shoes and run into other people as if there was no tomorrow. Hey, it's pretty bad, but never all that bad, eh? Off the top of my head, The Dentist song is one of my favourites. The Pancakes also collaborated with Ketchup and Chet Lam (who has rather impressive creds on the indie, but also pop music scene in HK) on an album called Freeplay, and the last track Arcturus is simply the best (presents sexual ambiguity in flashy wrapping paper and a bow), while many other tracks are, I think, cover tracks of each other. I subscribed to the paper version of Giant Robot, for $30 a year for 6 issues. I was first thinking of subscribing to that Canadian Asian mag, whose name I can't remember (I think it was "New Wave" or something in the like), and which is rather more a Canadian-Chinese publication, from the names of the editors. But Giant Robot is a lot more interesting, visually, and contents wise, as it does focus on pop culture (and not necessarily of Asian persuasion, but mostly so), rather than touching to everything from food to relationships counseling. I have yet to read the issue I just bought, as well as that other Canadian-Chinese/Asian mag I got already two months ago. Without mentioning what it was, there was a very small image in Giant Robot of an issue of Asian Boston, the anecdotal "Asian" publication that isn't by Asians, and even less for Asians, and which deservedly caused a storm in the New England Asian community (at least according to articles linked to in AAM). I saw a lot of Asian people downtown tonight, and it was probably because shopping malls were just full of people, point. Which reminds me that I could still do some Christmas shopping, err? I also have to work tomorrow morning, as usual (was caught up in Civ4, urgh), but after that, it's a week-long vacation until January 3rd. Here's a very interesting article in the Economist about the socio-economical choices we are making when doing the groceries. "Conventional political activity may not be as enjoyable as shopping, but it is far more likely to make a difference." The article puts sense into what I intuitively adopt for myself. I don't buy organic food, because it doesn't make economical sense to waste resources while the rest of the planet is starving. Although I wholeheartedly buy and consume luxury food, I don't think it should apply to basic food that is worth the same nutritional value no matter its method of production. The biggest reason people invoke when buying organic produces is that it is a greener choice. This might not even be true, if you consider that organic production requires more resources, and more land than conventional growing, that relies on pesticides that work, and all sorts of modified crops that (I assume that plant biology is that advanced) can absorb water better, and grow more efficiently with lesser amounts of fertilizer. Certainly, the Economist is a liberal newspaper, which supports free trade. It isn't a surprise that they also go in lengths at destroying the so-called myth of sustainability of Fairtrade. They're like subsidies in disguise to a sector that shouldn't be encouraged to expand. I think that ultimately what we, as consumers, attempt to do, is let more farmers live from coffee, despite the idea that it might not be the best for them, economically-speaking (maybe they should move to other types of crops, or maybe they should just give up agriculture altogether). I rarely do this sort of thing, but metros, how can I resist? It's from Metros from the world. Seriously, there's something attractive about this activity. Of course, it's to say "oh I've been to this city! ", but subways are the foreign daily life cool that, if you're in a certain category of tourist, will want to do. Idem for supermarkets and cinemas, and beaches. Continue reading Metros from the world. There was a very interesting story in last week's issue on the Suez Canal Crisis, one of those historical events we know about, but then don't know much about in details, like the Tian'anmen square massacre. It was fifty years ago - and in it, a dramatic recounting of how the old Europe tries in vain to re-assert itself, how political characters tragically cause their own failure, and how the Americans sided against Israel for the last time (so we'll see, as the Lebanon crisis/war evolves). I guess I see the appeal of long historical and political essays which I don't have the patience to read, and thank magazines for providing at least a bit of the entertainment. Also, in this week's issue, Hong Kong public housing crumbling into shambles (on the culture of defenestration). Doesn't sound much better in Chinese (in pinyin, roughly, fan mian zi/qi jia). It's the Chinese restaurant owned by a Chinese-Cambodian couple on De Maisonneuve, near St-Marc, and near the little Taiwanese eatery. Went there tonight, and asked them what we could get that was sort of Cambodian Chinese, and the lady served us a delicious red curry chicken stew. The curry sauce (appropriately hot, coconut milk based, and with some basil leaves scattered in it) was absolutely great on the rice. Portion was tiny, but alright expensive. Also had a plate of inconsequential beef in shallots/ginger, and some tung choy ("hollow veggies") - all veggies cooked at the restaurant is better, b/c they have the firepower for it. $25 for two, with tips and taxes. Rice incl. I like that limited-time summer show Pour la suite des choses a lot. After interviewing Miss Chinese, Patrick Masbourian hosts a round table on the theme of visible minorities on Quebec TV, who are under-represented and hold stereotyped roles when they do happen to be shown. I don't know about that; I hardly watch any TV shows made in Quebec (last show I followed was probably during high school), and the only thing I do watch in French are the news, the food show on R-C, and RDS Canadiens hockey. What is troubling is that from ads for these shows, there is indeed a disproportion of cultural communities in TV. Virginie, a long-running daily soap is 95% white French-Canadian (what school in Montreal is actually like this nowadays?). All the actors on TV are French. Etc, etc. I take note that there's Mao Bougon, played by an adopted Chinese girl (I think? ), and a Vietnamese dude playing a gangster (I think who could've been from any background) in currently-running underworld series Casino, who take somewhat un-stereotyped roles (in appearance, cuz I haven't seen the shows). Continue reading Visible minorities on Quebec TV. 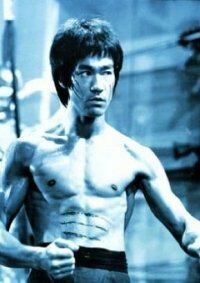 Continue reading When angryasianman.com is not good enough. Looks like we're having a house party, but no, it's instead the representation of North American lifestyle gone totally bad. Not shown in pic is a fifth car parked on the street belonging to the renovations' guy. 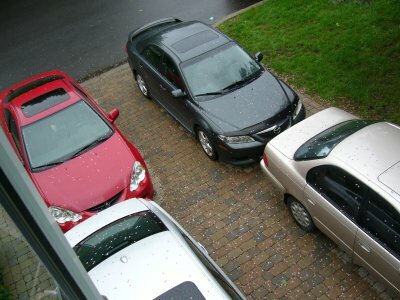 My brother bought a second-hand end-of-lease red Acura. I get to have his old car (bottom-right), Toyota 1993, which used to be my mother's (who drove it only sporadically) and was then taken over by my dad 2-3 years ago for city-driving, and ultimately went to my brother at the end of last summer (who, says my mother -I paraphrase- treated it like crap). Anyways, it's mine, yet I can't drive it. Ouch, the irony. So I went to the Montreal consultation for the head tax issue this afternoon, at the new Chinese community centre in Chinatown. The room was packed with victims of the Head Tax and Exclusion Act. The head tax was a tax imposed on every immigrant of Chinese origin starting in 1885, and until 1947. In the meanwhile, the Chinese Immigration Act was adopted by the House of Commons in 1923 to limit Chinese immigration to 50 per year (link). I've never heard of the head tax or exclusion act until the last federal election campaign, nor did my direct family on both sides been affected by it. The consultation was hosted by Heritage Canada, and the minister herself, The Honourable Bev Oda was present. It was said that the venue held about 300 people, most of whom were elderly citizens of Chinese origin, and at most 20 people of my age or younger. Continue reading Re: Head tax redress consultation in Montreal. Filipino table manners innapropriate in Canada? The Chinese community is invited to a consultation on redress for the Chinese Head Tax and Exclusion Act this Saturday April 29 at the Cultural Centre on Clark street in Chinatown, beginning at 13:30. Bev Oda, Minister of Canadian Heritage and Jason Kenney, special assistant to Prime Minister Stephen Harper, will be here to listen to what the Chinese community in Montreal want in terms of redress. Prime Minister Harper announced in the Throne Speech on April 4 that this year, we will finally receive an apology. However, the government would also like to hear what the community would like in terms of a full redress. Please come in great numbers to show that the community supports full redress, especially for the direct victims of these racist immigration laws, and please come out to support the families as they tell their stories to the government for the first time! A very interesting article in tomorrow's NYT magazine, in very nice reporting style about the woes of Google in China. I share the views of Google, and people in China: it's better to have a bit of Google than no Google at all (but it's a whole different thing when there's active collaboration, like in many cases where dissident e-mails have been exposed, etc). I think that most people are aware of the censorship, but live with it. My political history prof in cegep used to tell us how the youth became desensitized to the business of politics after 1989. If I am correct, people simply focus on economic growth with little or no democracy - just like HK in the 60s-90s, Taiwan of the Kuomingtang, and South Korea of the not-so-distant dictatorship, or hey, Singapore of today (or the quasi single-party Malaysia). There's something I can't grasp. I tried reading up on Taoism and Confucianism. Let there be economic growth, and some level of democracy will appear. If it's not "democracy" with western-style institutions, then at least let it be transparency in the affairs of the Party. In the very end, the people who govern seek the good for their country (if not, some way or another, there will be unrest). Got a hold on the A Chink In The Armour documentary by Canadian-Chinese Baun Mah. Extremely clever but the guys serves using IIS and really worth-watching. Remember, "Don't Hit The Cone". "Cities with large Chinese Canadian populations"
The idea came up when I was looking for statistics of how big Canadian cities were (I was thinking, well, except the cities currently with NHL teams, what other cities could sustain one, just based on population), and the wikipedia search for "Canadian cities" returns anything *but* the list of largest Canadian cities - rather a list of cities with the largest Chinese Canadian populations (of all things). Montreal scores a lowish 50,000 - I guess that you have to blame it on French, b/c most of the ethnic Chinese immigrants who speak a foreign language happen to speak English (if you're from HK or Taiwan or Singapore), even if that hasn't stopped anyone speaking anything but their mother tongue from immigrating to anywhere. *But*, it's common sense that places where a community has already been established will draw more fresh immigrants from that community. For instance, my dad is a Madagascar Chinese (my mom's a one-generation Vietnam Chinese), and while he came in the 70s, I noticed how starting in the 90s, we suddenly had many more (and larger) weddings to attend. Continue reading "Cities with large Chinese Canadian populations". In the midst of all this racism-related talk, my brother and girlfriend and friend rented Crash, which we finished watching just now. Definitely a topic more fundamental to treat of. Forbidden loves can wait. "The police are a bunch of monkey" - just been reported on the radio. I've been listening to all sorts of things on the radio. Whereas some people listen to the equivalent TV shows (excellent ones on RDI, every day), I do it on the radio, b/c I need to hear something when I work. Or I need to keep the background of my mind busy, while the foreground does grunt work. I don't know. But what I know is that the French Radio One is having a series of documentaries on the theme of intimacy. Intimacy in couplehood, but also intimacy online, in reality tv and the likes. One of the people on yesterday's show was quoting Freud, who was saying how guilt burdened people at the turn of the century, a hundred years ago - while now, it's probably narcissism. Something like that - the idea of feeling important online. Some teenagers act in surprise when they learn their parents might read their blogs. My parents won't, unless I'm on a trip at the other end of the world. Similarly for close real-life friends ("It's boring/depressing that you talk about Montreal"). I can, or should, take down certain old sites, but to me, it's lost in cyberspace, and it is as public as those pre-1960s scientific magazines "in storage" at some unknown location, b/c the library can't keep them all on shelf. Yeah, so I'm not taking down my old sites. And with a morbid twist, you don't know when you are going to dissapear, so what if you want to leave something behind; wouldn't a blog (no matter how self-censored it is) be the best everyman's autobiography. Blah blah blah, I can't believe my mind travelled from "intimacy" to "family tree". 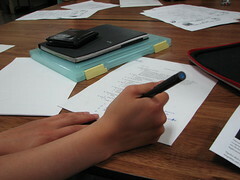 This page is a archive of recent entries in the Society category. Real-life blues is the previous category. t3h g33kn3$$ is the next category.